REVIEW - Warhammer: The End Times - Vermintide - Use a Potion! 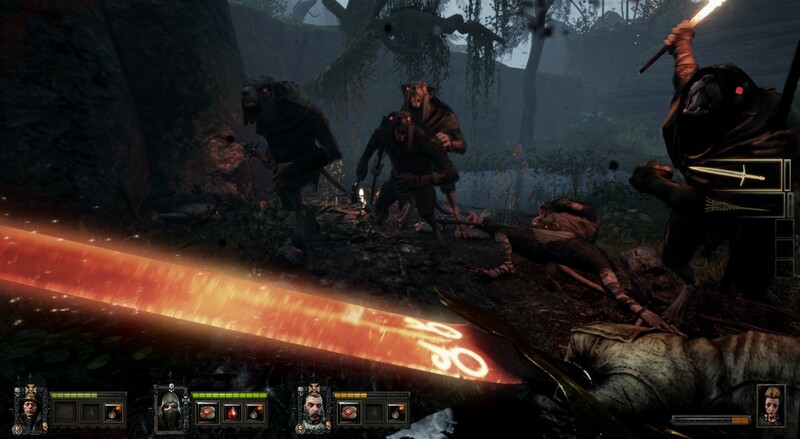 When you first start playing Warhammer: The End Times – Vermintide it’s easy to break out the Left 4 Dead comparisons. First person four player co-operative multiplayer? Check. Swarms of monstrous enemies constantly attacking you? Check. Point A to B gameplay with a dependence on survival and working together? Check. Heck, even the attributes of enemies and their attacks share resemblances too. 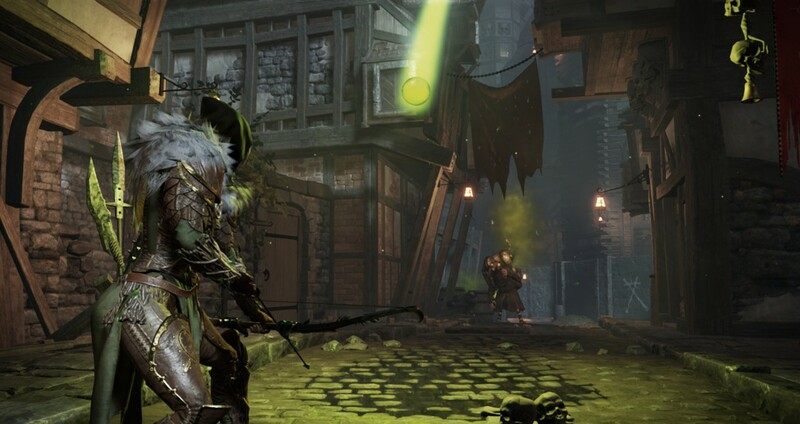 Whilst the inspiration is clearly worn like a badge of honour, Vermintide still manages to stand tall as its own game – with Valve’s apparent reluctance to add a ‘3’ to any of their titles, it certainly gives fans something new to soak the hours into. I think they’ll quickly find that this isn’t just a Left 4 Dead clone, but an enjoyable experience that offers enough to keep you hooked for a long time. I’ve never invested myself in the world of Warhammer (my only previous foray into the series being 2011’s Warhammer 40,000: Space Marine game) but the game doesn’t require you to have background knowledge of the universe in order to understand the narrative. It all takes place in Ubersreik, a gothic/medieval style city that has been attacked by the monstrous Skaven – a gross race of rat-men. 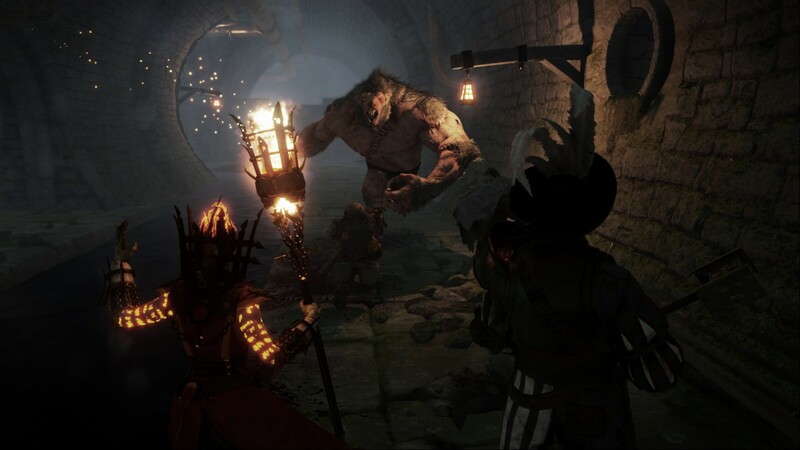 You take on the role of one of five heroes as they work together across thirteen missions to fight off the beasts and bring peace back to Ubersreik. Fans of the Warhammer series will appreciate the selection of heroes on offer – you have a choice of an elf waywatcher, an empire soldier, a dwarf ranger, a witch hunter and a bright wizard. Whilst each character has the same approach of up close melee battling mixed with ranged combat, they differentiate enough to each offer a different playing experience. I’ll admit that the Legolas fan-boy inside of me instantly drew me to Kerillian, the elf waywatcher, though I did enjoy using the others too. The main hub of the game is based within the safe haven of an inn. Here you can party up with three other players and tackle the many missions of the game. There are plenty of missions to play through that each see you exploring different areas of Ubersreik. They come in varying sizes too that are typically long enough to keep you busy but short enough to keep you interested. The objectives you face will also require you to work well as a team to complete – teamwork certainly plays a big role in the game. Whilst things feel fresh the first time, the emphasis on re-playing missions later on in the game can start to make things feel a little stale at times. It’s enjoyable to play, but you’re essentially left doing the same things over and over. It’s not so bad when playing with friends, but when it’s with complete strangers or AI companions you’ll find things can get a little boring. There are some missions that stand out though – I’ll never get bored of taking on the ‘White Rat’. Of course, the hordes of Skaven that are out for blood will keep you on your toes. I’ll admit, before playing I didn’t think that they would be that intimidating a foe; I’ve slain plenty of rat-like enemies during my time with games that they’ve never felt that fierce an adversary. That isn’t the case with Vermintide though, the Skaven using their power in numbers to take you down. You’ll find yourself outnumbered at times and if you get overwhelmed your health will drain away quickly. Admittedly, you generally face them in smaller numbers and will find they’re easy enough to slice, dice and decapitate – the blood of Skaven will certainly turn Ubersreik red by the time you’re through with them. You’ll encounter a good variety of Skaven throughout each mission though, each posing a different threat with their attacking styles. There are the Stormvermin who are well armoured, requiring a well place headshot to take down effectively. There’s the Globadiers who’ll take you out with poison gas grenades, continually wiping out your health. Gunners will take you out from range with a machine gun whilst Gutter Runners will pounce at you, rendering you incapacitated until one of your allies can rescue you. Worst of all though are the Rat Ogres, whose size and strength require competent teamwork to take out. There’s a strong variety of enemies out to get you and each offer something different to be wary of. Fans of Left 4 Dead may certainly notice the resemblances to certain zombie counterparts though. 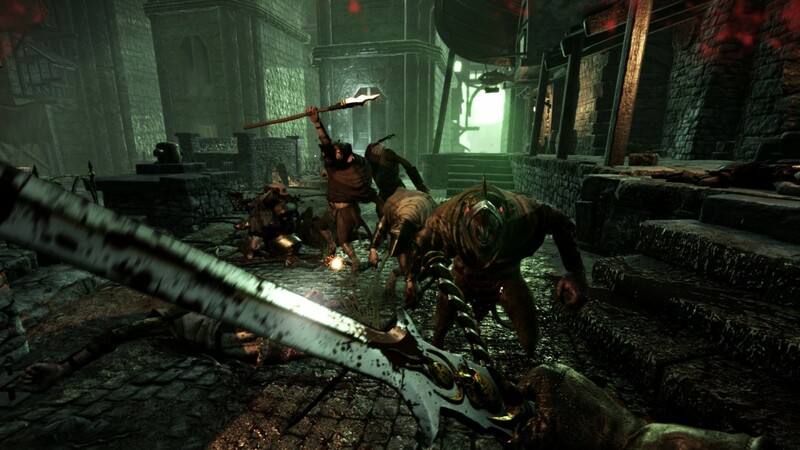 Whilst I’ve mentioned the similarities to Left 4 Dead, there are a few areas where Vermintide certainly differentiates – the combat being one of them. Whilst you’re equipped with ranged weaponry there is a strong focus of getting up close and dishing out damage with melee weapons. Whilst it may not always the best tactic to take on hordes of Skaven up close, it certainly feels satisfying to slice through them with swords and daggers. There are plenty of weapons to unlock as you progress through the game too, so you’ll certainly have a strong arsenal to choose from after a few hours with the game. Ranged combat didn’t offer the same satisfaction to me – it almost felt a little too easy to stand back and shoot at times, especially if your team mates are distracting the enemies up close. Whilst it’s a sound tactic, it takes away from the tension and excitement – nothing beats getting stuck in and slicing the head of your Skaven foes. There’s an abundance of ammo too, resulting in the over-use of your ranged weapon feeling inconsequential. Another feature unique to Vermintide is its loot system – at the completion of a level each player rolls some dice, the value of the dice you roll determining the quality of the weapon you’ll gain. It’s an interesting system and certainly adds momentary excitement whilst finding out what weapon you’ve earned. Don’t always expect a weapon for the class you are playing as though; loot is random, so even if you are playing as an empire soldier it won’t stop you unlocking a weapon for the dwarf. It at least motivates you to play as the other classes if you want to try out some of the cool weapons you’ve earned. You’ll find that the loot is one of the main incentives to keep you re-playing missions later in the game, so it’s handy there are a few methods to boost your chances at grabbing the best loot. There are tomes hidden throughout each level, each tome offering you an extra special dice when determining your loot quality. There’s also a grimoires to be found – whilst these lower the health of the entire party, they greatly boost your chance of gaining the best loot. Both the tomes and grimoires will certainly factor into your playthrough, especially if you’re hoping to grab the best weapons in the game. 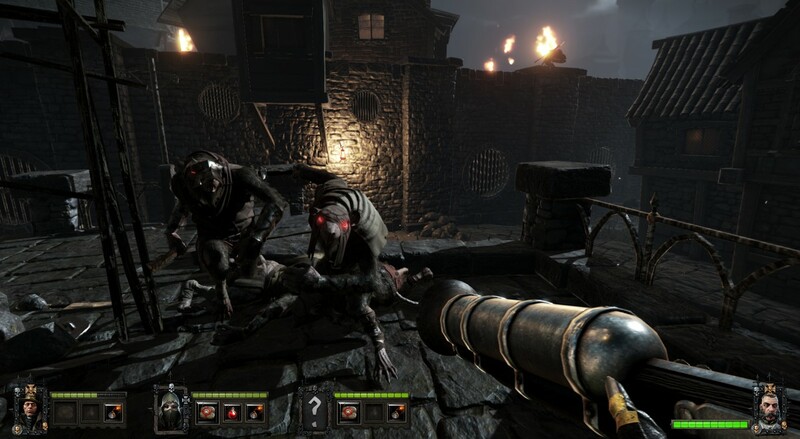 I’ve not been shy in mentioning the Left 4 Dead similarities, but Vermintide offers an enjoyable experience that differentiates itself enough from the zombie shooter to stand tall as its own game. The melee focused battling is superb and the loot system will keep you replaying those missions in order to grab the best gear. Whilst things can feel a little stale at times, the variety of enemies and Warhammer setting will keep drawing you in to take on the Skaven for hours on end – you won’t want to rest until Ubersreik is free of the scum!